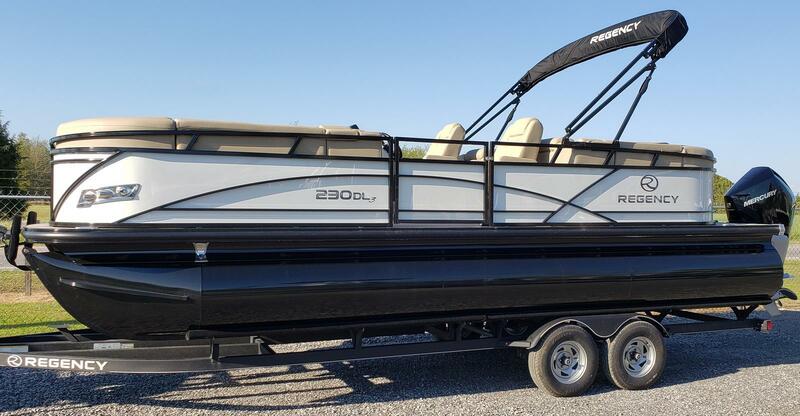 2019 Regency 230 DL3 pontoon with Mercury 250 V8 Verado four stroke. Rated for 12 passengers. Includes ski pylon, in-floor lighted storage, Lowrance Hook2 7 depth finder/GPS, Bluetooth stereo, 11 foot bimini top with hydraulic assist, twin captains chairs, and much more. All logs and fence are powder coated for long lasting good looks and ease of cleaning. Galvanized, powder coated trailer is included in the price. Pontoon season is here and Regency is ready for you!